The robbers in clown masks had the element of surprise, but the Texas couple they threatened fought back, police say. Two men wearing clown masks and wielding machetes pulled up alongside a couple sitting in their truck in their driveway in Texas City just before 2:30 a.m. on Feb. 1, according to a police report obtained by KPRC. Texas City is a town of nearly 50,000 residents that sits along Galveston Bay near the Gulf Coast. One of them, wearing a white mask, orange hair and a big red nose, went to the truck’s driver side, placed his machete on the neck of the man sitting at the wheel and said, “You’re gonna give it up, or I’m gonna cut you,” according to the report. Thomas told his wife, Aretha Cardinal, who was sitting in the passenger seat, to get out and find a weapon, as he began to struggle with his attacker, according to KRIV. So she grabbed her granddaughter’s scooter from the front yard and started swinging, the station reported. Cardinal started hitting both of the machete-wielding clown robbers with the child’s two-wheel scooter, the Galveston County Daily News reported, and Thomas eventually took his attacker’s machete away. She also used the scooter to bust out one of the windows of the suspects’ car as they ran back to the car and fled, the Daily News reported. Texas City police arrested the alleged clown-masked assailants just a few minutes later, according to jail records. 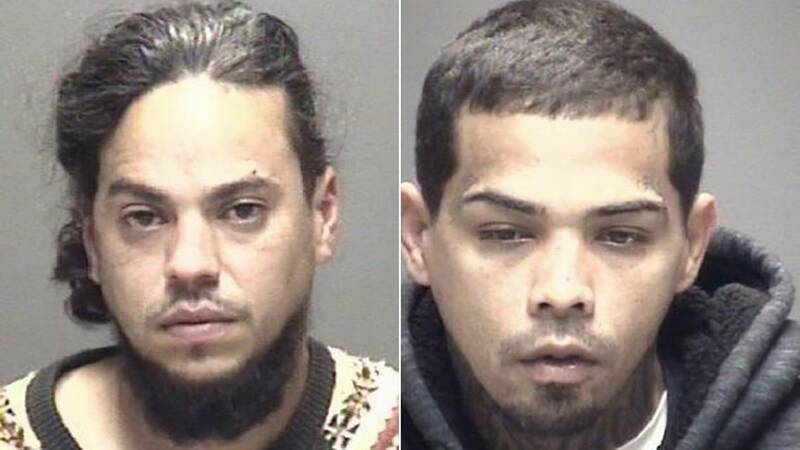 Jose Noel Lugo, 35, of Texas City and Luis Jiminez, 32, of nearby La Marque remained in Galveston County Jail Thursday, facing aggravated robbery charges. Their bond is set at $100,000 apiece as they await trial.